Pale, non-yellowing mixing oil, similar in colour to walnut oil. Enhances true colour of artist pigments. Dries more quickly and evenly than walnut oil. Dries with a glossy finish and has superior handling and blending characteristics. No drying agents or solvents required. 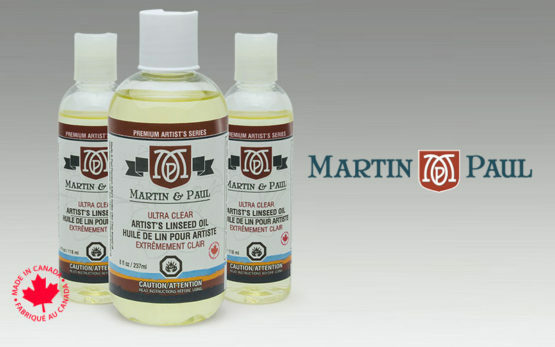 Martin & Paul oil offers many advantages over oil from other linseed oil manufacturers sold for fine art applications. PTC oil is pale in colour, comparable or superior to the lightness of walnut oil, with the advantage that it dries much more quickly and evenly than walnut oil. This virtually eliminates the tendency of paints blended with this oil to crack as they dry. PTC extensively purifies Martin & Paul oil to create a non-yellowing mixing agent that will maintain and even enhance the true colour of artist pigments. Since it dries quickly in comparison to conventional oil, this eliminates the need to add drying agents and solvents, producing a very low odour, non-toxic product. This oil offers a painting medium with superior handling and blending characteristics, and dries with a glossy finish, enhancing the texture and depth of the completed art work. Our oil offers artists a new and simplified approach to painting with oils.